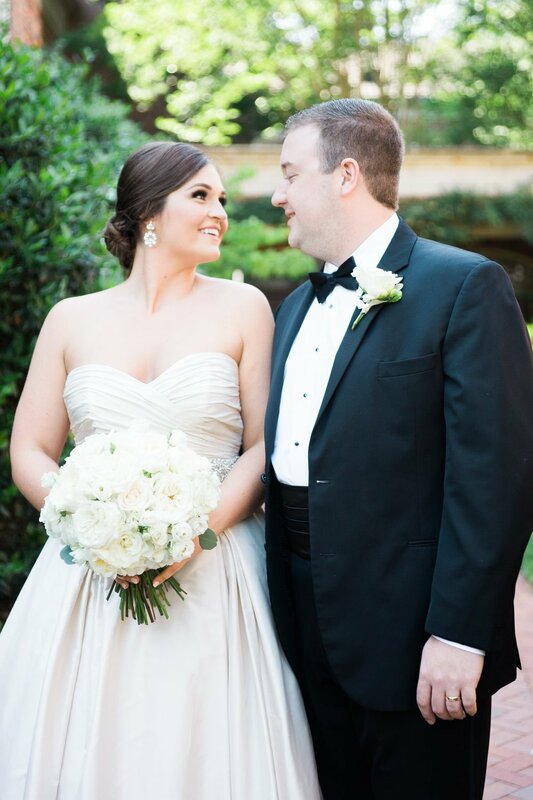 Our sweet Maggie Louise Bride Amanda married her sweetheart Andrew this past May in Birmingham, Alabama + she couldn’t have looked more beautiful in her Paloma Blanca ballgown filling our hearts with joy here at Maggie Louise! 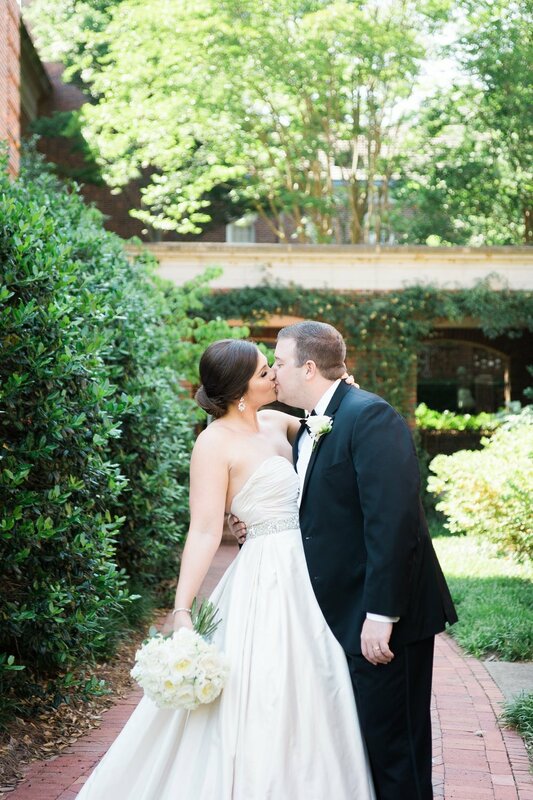 We are thrilled to share a little peek at this sweet couple’s special day. Here in her own words Amanda tells the story of her love and special day. Enjoy! How did y’all meet? Tell us your love story. : Andrew and I met while we were both students at the University of Alabama at a local bar in Tuscaloosa called The Bear Trap through some mutual friends in August 2014. We kept seeing each other throughout that fall semester going fraternity/sorority parties and going on dinner dates. As Christmas got closer, I knew we would have to end things since he was graduating and planned to move to San Francisco for work after graduation. About a week before finals, he let me know that his office asked him to relocate to Birmingham, AL. In January of 2015, we officially began dating and have been together ever since! How did he propose? : Andrew was very sneaky and cool about the whole plan. Normally I can find out about surprises but not this one! In November of 2016, we planned a dinner for our families in Birmingham. Both of our families would be in town for the Alabama vs Mississippi State game (being that his dad is a huge State fan) and our families have multiple birthdays in the month of November. As we walked up to The Club for dinner (birthday cake in hand) I could see our families outside on the balcony looking at the view of downtown Birmingham. Before I knew what was happening, Andrew was down on one knee asking me to marry him. I'm still not sure I actually said yes I just squealed and nodded my head. It was such a special night made even more special by Andrew surprising me and having both of our best friends there too. We had dinner and drinks to celebrate our families becoming one big family. It was one of the best nights of my life! What was your most memorable moment about your wedding day? : The most memorable moment about our wedding day was by far our first look. For weeks before the wedding, I joked with Andrew that he better cry when he saw me or I would turn around. I had never seen Andrew cry at all and he's not a super emotional guy. So when it came time for our first look, of course I was crying before I walked out to the courtyard. As soon as Andrew turned around, I saw the biggest smiles and the sweetest most genuine tears of happiness roll down his face, which of course made me cry more. It was such a sweet and intimate moment that I will remember for the rest of my life. What was the design inspiration or theme for your wedding? Why was this special to you as a couple? : We wanted our day to be very classic - a true representation of us. We had all white flowers and lots of silver and glass. The guys wore classic Vera Wang black and white tuxes and my girls wore stunning grey formfitting dresses. Best advice you received while planning for marriage or your big day. : Not everything is going to go to plan on your wedding day which as a Type A personality, was devastating to hear. It doesn't matter how perfectly planned everything is, something is bound to go wrong. But the important part is to remember why you are there and that you are starting the rest of your life with your best friend. What advice would you give to someone currently planning his or her wedding? : BE PRESENT. 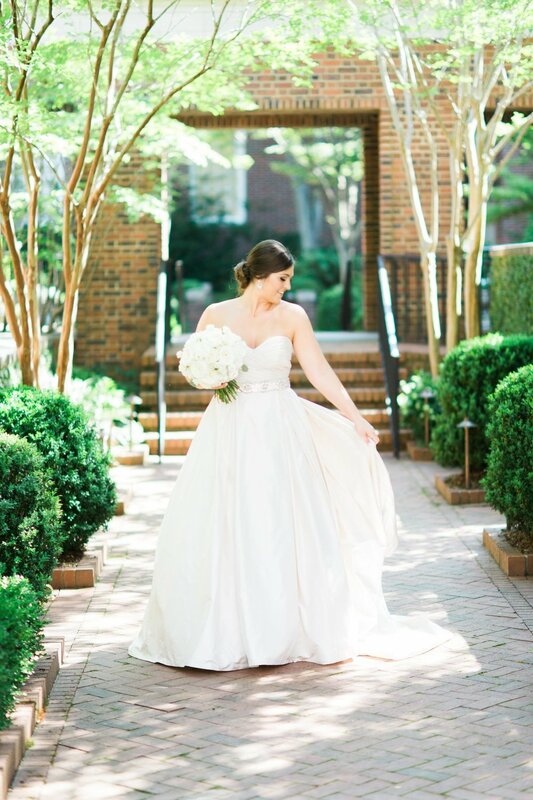 It is so, so easy to get caught up in planning and colors and flowers and guest lists. Slow down. Breathe. Enjoy this time of life you are in. It truly does go so quickly. Make sure to have normal conversations with your fiancé and not just make every day about wedding planning. It will be over before you know it! Favorite part of the wedding planning process? : Wedding dress shopping by far! What made you choose Maggie Louise when searching for your gown? : I knew that I wanted to go to Maggie Louise since wayyyy before I was engaged. The shop is 2 minutes away from my childhood home and I knew of multiple girls who found their dream gown at Maggie Louise! As soon as I got engaged, I made an appointment "just to look" (yeah right). I thought the process would be so much more complicated being a person who typically has trouble making decisions. Carolyn and Molly made choosing my dress the easiest part of the while planning process. My dream dress was something no one thought I would end up in, but when I put it on I truly had that "holy moly I'm a bride" moment. The girls at Maggie Louise made every part of the process from the first appointment to dress pick up unbelievably simple and comfortable. I'm forever thankful for Maggie Louise! Tell us anything extra you'd like to share about your journey down the aisle + all that lies ahead. : Andrew and I are planning to buy our first house together in Birmingham soon! We have been almost nonstop traveling since our honeymoon and are planning even more trips for 2019!